More than ninety per cent of American hospitals have been computerized during the past decade, and more than half of Americans have their health information in the Epic system. Seventy thousand employees of Partners HealthCare – spread across twelve hospitals and hundreds of clinics in New England – were going to have to adopt the new software. I was in the first wave of implementation, along with eighteen thousand other doctors, nurses, pharmacists, lab techs, administrators, and the like. The surgeons at the training session ranged in age from thirty to seventy, I estimated – about sixty per cent male, and one hundred per cent irritated at having to be there instead of seeing patients. Our trainer looked younger than any of us, maybe a few years out of college, with an early-Justin Bieber wave cut, a blue button-down shirt, and chinos. Gazing out at his sullen audience, he seemed unperturbed. I learned during the next few sessions that each instructor had developed his or her own way of dealing with the hostile rabble. One was encouraging and parental, another unsmiling and efficient. Justin Bieber took the driver’s-ed approach: You don’t want to be here; I don’t want to be here; let’s just make the best of it. 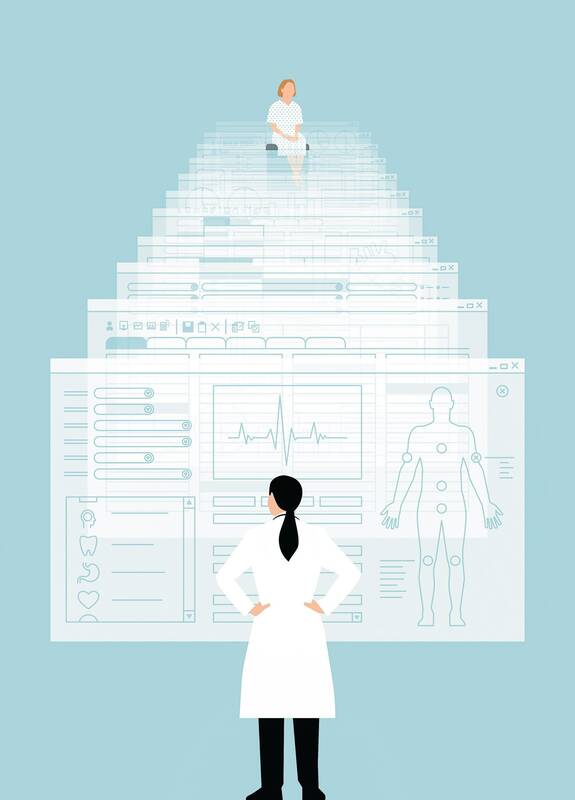 My hospital had, over the years, computerized many records and processes, but the new system would give us one platform for doing almost everything health professionals needed – recording and communicating our medical observations, sending prescriptions to a patient’s pharmacy, ordering tests and scans, viewing results, scheduling surgery, sending insurance bills. With Epic, paper lab-order slips, vital-signs charts, and hospital-ward records would disappear. We’d be greener, faster, better. But three years later I’ve come to feel that a system that promised to increase my mastery over my work has, instead, increased my work’s mastery over me. I’m not the only one. A 2016 study found that physicians spent about two hours doing computer work for every hour spent face to face with a patient – whatever the brand of medical software. In the examination room, physicians devoted half of their patient time facing the screen to do electronic tasks. And these tasks were spilling over after hours. The University of Wisconsin found that the average workday for its family physicians had grown to eleven and a half hours. The result has been epidemic levels of burnout among clinicians. Forty per cent screen positive for depression, and seven per cent report suicidal thinking – almost double the rate of the general working population. In the first five weeks, the I.T. folks logged twenty-seven thousand help-desk tickets – three for every two users. Most were basic how-to questions; a few involved major technical glitches. Printing problems abounded. Many patient medications and instructions hadn’t transferred accurately from our old system. My hospital had to hire hundreds of moonlighting residents and pharmacists todouble-check the medication list for every patient while technicians worked to fix the data-transfer problem. Many of the angriest complaints, however, were due to problems rooted in what Sumit Rana, a senior vice-president at Epic, called “the Revenge of the Ancillaries.” In building a given function – say, an order form for a brain MRI – the design choices were more political than technical: administrative staff and doctors had different views about what should be included. The doctors were used to having all the votes. But Epic had arranged meetings to try to adjudicate these differences. Now the staff had a say (and sometimes the doctors didn’t even show), and they added questions that made their jobs easier but other jobs more time-consuming. Questions that doctors had routinely skipped now stopped them short, with “field required” alerts. A simple request might now involve filling out a detailed form that took away precious minutes of time with patients. She gave me an example. Each patient has a “problem list” with his or her active medical issues, such as difficult-to-control diabetes, early signs of dementia, a chronic heart-valve problem. The list is intended to tell clinicians at a glance what they have to consider when seeing a patient. Sadoughi used to keep the list carefully updated – deleting problems that were no longer relevant, adding details about ones that were. But now everyone across the organization can modify the list, and, she said, “it has become utterly useless.” Three people will list the same diagnosis three different ways. Or an orthopedist will list the same generic symptom for every patient (“pain in leg”), which is sufficient for billing purposes but not useful to colleagues who need to know the specific diagnosis (e.g., “osteoarthritis in the right knee”). Or someone will add “anemia” to the problem list but not have the expertise to record the relevant details; Sadoughi needs to know that it’s “anemia due to iron deficiency, last colonoscopy 2017.” The problem lists have become a hoarder’s stash. “They’re long, they’re deficient, they’re redundant,” she said. “Now I come to look at a patient, I pull up the problem list, and it means nothing. I have to go read through their past notes, especially if I’m doing urgent care,” where she’s usually meeting someone for the first time. And piecing together what’s important about the patient’s history is at times actually harder than when she had to leaf through a sheaf of paper records. Doctors’ handwritten notes were brief and to the point. With computers, however, the shortcut is to paste in whole blocks of information – an entire two-page imaging report, say – rather than selecting the relevant details. The next doctor must hunt through several pages to find what really matters. Multiply that by twenty-some patients a day, and you can see Sadoughi’s problem. “Ordering a mammogram used to be one click,” she said. “Now I spend three extra clicks to put in a diagnosis. When I do a Pap smear, I have eleven clicks. It’s ’Oh, who did it?’ Why not, by default, think that I did it?” She was almost shouting now. “I’m the one putting the order in. Why is it asking me what date, if the patient is in the office today? When do you think this actually happened? It is incredible!” The Revenge of the Ancillaries, I thought. Years before, a graduate student had written a program, called Fluidity, that allowed the research group to run computer simulations of small-scale fluid dynamics – specifically, ones related to the challenge of safely transporting radioactive materials for nuclear reactors. The program was elegant and powerful, and other researchers were soon applying it to a wide range of other problems. They regularly added new features to it, and, over time, the program expanded to more than a million lines of code, in multiple computer languages. Every small change produced unforeseen bugs. As the software grew more complex, the code became more brittle – more apt to malfunction or to crash. Scientists now talked of “old Fluidity,” the smaller program with fewer collaborators which left scientists free to develop their own idiosyncratic styles of research, and “new Fluidity,” which had many more users and was, accordingly, more rule-bound. Changes required committees, negotiations, unsatisfactory split-the-difference solutions. Many scientists complained to Spencer in the way that doctors do – they were spending so much time on the requirements of the software that they were losing time for actual research. “I just want to do science!” one scientist lamented. The Tar Pit has trapped a great many of us: clinicians, scientists, police, salespeople – all of us hunched over our screens, spending more time dealing with constraints on how we do our jobs and less time simply doing them. And the only choice we seem to have is to adapt to this reality or become crushed by it. In recent years, it has become apparent that doctors have developed extraordinarily high burnout rates. In 2014, fifty-four per cent of physiciansreported at least one of the three symptoms of burnout, compared with forty-six per cent in 2011. Only a third agreed that their work schedule “leaves me enough time for my personal/family life,” compared with almost two-thirds of other workers. Female physicians had even higher burnout levels (along with lower satisfaction with their work-life balance). A Mayo Clinic analysis found that burnout increased the likelihood that physicians switched to part-time work. It was driving doctors out of practice. Sadoughi told me of her own struggles – including a daily battle with her Epic “In Basket,” which had become, she said, clogged to the point of dysfunction. There are messages from patients, messages containing lab and radiology results, messages from colleagues, messages from administrators, automated messages about not responding to previous messages. “All the letters that come from the subspecialists, I can’t read ninety per cent of them. So I glance at the patient’s name, and, if it’s someone that I was worried about, I’ll read that,” she said. The rest she deletes, unread. “If it’s just a routine follow-up with an endocrinologist, I hope to God that if there was something going on that they needed my attention on, they would send me an e-mail.” In short, she hopes they’ll try to reach her at yet another in-box. As I observed more of my colleagues, I began to see the insidious ways that the software changed how people work together. They’d become more disconnected; less likely to see and help one another, and often less able to. Jessica Jacobs, a longtime office assistant in my practice – mid-forties, dedicated, with a smoker’s raspy voice – said that each new software system reduced her role and shifted more of her responsibilities onto the doctors. Previously, she sorted the patient records before clinic, drafted letters to patients, prepped routine prescriptions – all tasks that lightened the doctors’ load. None of this was possible anymore. The doctors had to do it all themselves. She called it “a ’stay in your lane’ thing.” She couldn’t even help the doctors navigate and streamline their computer systems: office assistants have different screens and are not trained or authorized to use the ones doctors have. In Meyer’s view, we’re only just beginning to experience what patient benefits are possible. A recent study bolsters his case. Researchers looked at Medicare patients admitted to hospitals for fifteen common conditions, and analyzed how their thirty-day death rates changed as their hospitals computerized. The results shifted over time. In the first year of the study, deaths actually increased 0.11 per cent for every new function added – an apparent cost of the digital learning curve. But after that deaths dropped 0.21 per cent a year for every function added. If computerization causes doctors some annoyance but improves patient convenience and saves lives, Meyer is arguing, isn’t it time we all got on board? And yet it’s perfectly possible to envisage a system that makes care ever better for those who receive it and ever more miserable for those who provide it. Hasn’t this been the story in many fields? The complaints of today’s health-care professionals may just be a white-collar, high-tech equivalent of the century-old blue-collar discontent with “Taylorization” – the industrial philosophy of fragmenting work into components, standardizing operations, and strictly separating those who design the workflow from those who do the work. As Frederick Winslow Taylor, the Progressive Era creator of “scientific management,” put it, “In the past, the man has been first; in the future, the system must be first.” Well, we are in that future, and the system is the computer. Adaptation requires two things: mutation and selection. Mutation produces variety and deviation; selection kills off the least functional mutations. Our old, craft-based, pre-computer system of professional practice – in medicine and in other fields – was all mutation and no selection. There was plenty of room for individuals to do things differently from the norm; everyone could be an innovator. But there was no real mechanism for weeding out bad ideas or practices. But those processes cannot handle more than a few change projects at a time. Artisanship has been throttled, and so has our professional capacity to identify and solve problems through ground-level experimentation. Why can’t our work systems be like our smartphones – flexible, easy, customizable? The answer is that the two systems have different purposes. Consumer technology is all about letting me be me. Technology for complex enterprises is about helping groups do what the members cannot easily do by themselves – work in coördination. Our individual activities have to mesh with everyone else’s. What we want and don’t have, however, is a system that accommodates both mutation and selection. Not long ago, I spent a day following Lynden Lee as he scribed at a Massachusetts General Hospital primary-care practice. Lee, a twenty-three-year-old graduate of Boston University, is an Asian-American raised in Illinois, and, like many scribes, he was doing the job, earning minimum wage, while he applied to medical school. He worked for Allan Goroll, a seventy-two-year-old internist of the old school – fuzzy eyebrows, steel-wool hair, waist-length white coat. Goroll faced Shteynberg across his desk. To his left, his computer sat untouched. To his right, Lee stood behind a wheeled laptop stand, his fingers already tapping at the keys. He’d pulled up information for Goroll to review as he came in – the notes from Shteynberg’s last visit with him, and recent visits to other specialists – and was starting to write a new medical note. The story Shteynberg told was complex, and unfolded, as medical stories often do, in pieces that were difficult to connect. She had been having sudden, unusual episodes. They sometimes made her short of breath, at other times nauseated. While driving her car, she had an attack in which her heart raced and she felt so light-headed that she feared she might pass out. She had a history of high blood pressure, and she had frequent ear congestion. Goroll probed and listened, while Lee recorded the details. Every once in a while, the doctor asked Lee to look up information – the trend of her last blood-pressure measurements, or the results of various tests she’d had. He paused to tell Lee how to organize the information: to list faintness, high blood pressure, and ear congestion as three separate problems, not one. We are already seeing the next mutation. During the past year, Massachusetts General Hospital has been trying out a “virtual scribe” service, in which India-based doctors do the documentation based on digitally recorded patient visits. Compared with “live scribing,” this system is purportedly more accurate – since the scribes tend to be fully credentialled doctors, not aspiring med students – for the same price or cheaper. IKS Health, which provides the service, currently has four hundred physicians on staff in Mumbai giving support to thousands of patient visits a day in clinics across the United States. The company expects to employ more than a thousand doctors in the coming year, and it has competitors taking the same approach. A note for a thirty-minute visit takes Rane about an hour to process. It is then reviewed by a second physician for quality and accuracy, and by an insurance-coding expert, who confirms that it complies with regulations – and who, not incidentally, provides guidance on taking full advantage of billing opportunities. IKS Health says that its virtual-scribe service pays for itself by increasing physician productivity – in both the number of patients that physicians see and the amount billed per patient. Before working with Rane, Kong rarely left the office before 7 P.M., and even then she had to do additional work at home in order to complete her notes. Now she can leave at five o’clock. “I’m hopeful that this prevents me from burning out,” she said. “That’s something I was definitely aware of going into this profession – something that I really feared.” What’s more, she now has the time and the energy to explore the benefits of a software system that might otherwise seem to be simply a burden. Kong manages a large number of addiction patients, and has learned how to use a list to track how they are doing as a group, something she could never have done on her own. She has also learned to use a function that enters a vaccine table into patients’ notes, allowing her to list the vaccinations they should have received and the ones they are missing. Her biggest concern now? That the scribes will be taken away. Yet can it really be sustainable to have an additional personal assistant – a fully trained doctor in India, no less – for every doctor with a computer? And, meanwhile, what’s happening across the globe? Who is taking care of the patients all those scribing doctors aren’t seeing? But there’s also a techno-pessimist version of the story. A 2015 study of scribes for emergency physicians in an Atlanta hospital system found that the scribes produced results similar to what my Boston colleagues described – a thirty-six-per-cent reduction in the doctors’ computer-documentation time and a similar increase in time spent directly interacting with patients. Two-thirds of the doctors said that they “liked” or even “loved” having a scribe. Yet they also reported no significant change in their job satisfaction. With the time that scribes freed up, the system simply got doctors to take on more patients. Their workload didn’t lighten; it just shifted. Studies of scribes in other health systems have found the same effect. Squeezing more patients into an hour is better than spending time entering data at a keyboard. More people are taken care of. But are they being taken care of well? As patients, we want the caring and the ingenuity of clinicians to be augmented by systems, not defeated by them. In an era of professional Taylorization – of the stay-in-your-lane ethos – that does not seem to be what we are getting. He wasn’t a programmer, however, and wasn’t interested in becoming one. So he sought out Judy Thornton, a software analyst from the hospital’s I.T. department. Together, they convened an open weekly meeting, currently on Thursday mornings, where everyone in the neurosurgery department – from the desk clerks to the medical staff to the bosses – could come not just to complain about the system but also to reimagine it. Department members feared that Malhotra’s pet project would be a time sink. Epic heard about his plans to fiddle around with its system and reacted with alarm. The hospital lawyers resisted, too. “They didn’t want us to build something that potentially had a lot of intellectual property in someone else’s system,” Malhotra said. Now there was mutation and selection – through a combination of individual ingenuity and group preference. One new feature the department embraced, for instance, enlists the help of patients. At the end of a visit, doctors give the keyboard to patients, who provide their firsthand ratings of various factors that show how they’re progressing: their ability to walk without assistance, or their level of depression and anxiety. The data on mobility before surgery turned out to predict which patients would need to be prepared for time in a rehabilitation center and which ones could go straight home from the hospital. Malhotra’s innovations showed that there were ways for users to take at least some control of their technology – to become, with surprising ease, creators. Granted, letting everyone tinker inside our medical-software systems would risk crashing them. But a movement has emerged to establish something like an app store for electronic medical records, one that functions much the way the app store on your smartphone does. If the software companies provided an “application programming interface,” or A.P.I., staff could pick and choose apps according to their needs: an internist could download an app to batch patients’ prescription refills; a pediatric nurse could download one to set up a growth chart. Electronic-medical-record companies have fought against opening up their systems this way because of the loss of control (and potential revenue) doing so would entail. In the past couple of years, though, many have begun to bend. Even Epic has launched its “App Orchard.” It’s still in the early stages – only about a hundred apps are available, and there are strict limits on what kinds of customization it enables – but it’s a step in the right direction. The diagnosis seemed very unlikely, but a battery of tests had turned up surprising results, including abnormal levels of a pituitary hormone. I needed to log into the computer to check the original lab reports. He watched me silently click one tab after another. Minutes passed. I became aware of how long it was taking me to pull up the right results. Finally, I let go of the mouse and took Cameron to the examining table. When I’d finished the exam and we sat down again at my little computer desk against the wall, I told him what I’d determined. He had a parathyroid tumor, it had pushed his calcium levels dangerously high, and it needed to be removed surgically. I took out a pen and paper, and drew a picture to explain how the surgery would be done. First, though, we needed to get his calcium under control. The abnormal levels of the pituitary hormone suggested that he might have a tumor in his pituitary gland as well – and might even have the unusual genetic syndrome. I was less sure about this, I told him, so I wanted to do more testing and get an opinion from an expert at my hospital. Later, I thought about how unsatisfactory my response was. I’d wanted to put my computer away – to sort out what he’d understood and what he hadn’t, to learn a bit about who he really was, to make a connection. But I had that note to type, and the next patient stewing across the hall. The story of modern medicine is the story of our human struggle with complexity. Technology will, without question, continually increase our ability to make diagnoses, to peer more deeply inside the body and the brain, to offer more treatments. It will help us document it all – but not necessarily to make sense of it all. Technology inevitably produces more noise and new uncertainties. Perhaps a computer could have alerted me to the possibility of a genetic disorder in John Cameron, based on his history of skin lesions and the finding of high calcium. But our systems are forever generating alerts about possible connections – to the point of signal fatigue. Just ordering medications and lab tests triggers dozens of alerts each day, most of them irrelevant, and all in need of human reviewing and sorting. There are more surprises, not fewer. The volume of knowledge and capability increases faster than any individual can manage – and faster than our technologies can make manageable for us. We ultimately need systems that make the right care simpler for both patients and professionals, not more complicated. And they must do so in ways that strengthen our human connections, instead of weakening them.